We have been getting questions over the past few days about the oil spill in the Gulf of Mexico. Here the current analysis from Skidaway Institute of Oceanography. Drs. Jay Brandes and Dana Savidge contributed their input to this briefing. Much of the concern about the oil spill and the Georgia coast centers on the possibility of oil becoming entrained in the Loop Current. At present the position of the Loop Current is southward of the Deep Horizon well, so that most of the spilled oil has not been entrained into this strong current. Graphic by Anna Boyette, Skidaway Inst. However there are indications that some oil has begun traveling southwards on a section of the Loop current. Any oil that is entrained may eventually pass offshore of Florida, Georgia, and the Carolinas. The Loop Current is a continuous feature that exits the Gulf south of Florida and passes through the Florida Straits where it becomes known as the Florida Current (especially off Florida) or Gulf Stream. Along the east coast the flow strengthens somewhat from contributions from the Antilles Current and recirculations on the offshore side. All the named portions are known collectively as the Gulf Stream System. The average velocity experienced by oil entrained in the edge of the Gulf Stream should be about 1 mph, or about a half a degree of latitude per day, so it would be 2-3 weeks from the earliest knows entrainment on May 17 before that first surface oil gets here. Oil is degraded by sunlight and consumed by microorganisms. With the warm waters and intense sunshine of the Gulf of Mexico and the nearby Atlantic Ocean, those processes should be much more effective than they were during the Exxon Valdez spill. The oil will also be transformed by dilution and mixing with saltwater to become tar balls and denser oil-saltwater mixtures, which may not all be at the surface. Where and when that deeper part goes is harder to predict. Light and microbial degradation may not be as effective down deeper, and tar balls are more impervious to microbial degradation than surface oil slicks. Lifetime of the impervious tar balls in the ocean is estimated at about 1 year. When the oil does make it into the Gulf Stream, one factor that will help protect the Georgia coast is that the Gulf Stream runs roughly 75 miles off the coast. 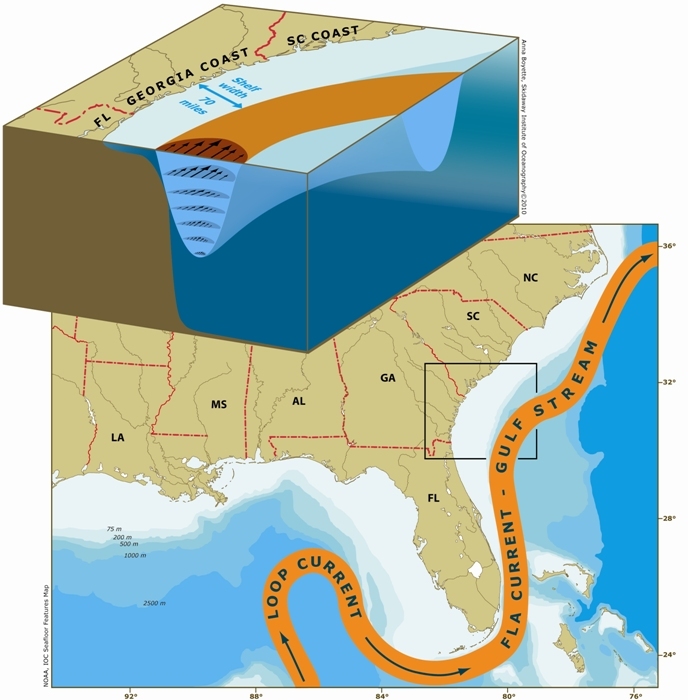 Since the Gulf Stream is a much deeper current (about ½ mile deep) than the shallow continental shelf (about a tenth as deep as the Gulf Stream) that fringes the coastline, it does not flow near shore, but tends to hug the edge of Georgia’s broad continental shelf. Florida and North Carolina are at higher risk because their shelves are much narrower so the Gulf Stream is closer to beaches, marshes, mangroves, and sounds. Once off the Georgia coast in the Gulf Stream, surviving entrained oil, mixtures, and tarballs would have to get across our broad shelf somehow before it could affect the beaches and marshes. Unfortunately the processes that might do that are poorly quantified or understood, so it could happen. An extreme event, like a hurricane, could potentially push oil in the Gulf Stream onto the shelf perhaps even as far as the Georgia coast. Other avenues may exist that can potentially move oil onshore as well. However there was a previous similar incident in 1979 when the IXTOC I oil spill occurred, pumping about 20,000 barrels of oil per day for 8 months from a well west of the Yucatan Peninsula. Some of that oil was also eventually entrained in the Loop Current. Skidaway researchers sampled 10 months after the blowout off Savannah, Ga. and New Smyrna Beach Fla., and found tar balls in the Gulf Stream and on outer shelf, but no evidence of tar balls within 40 miles of the coast. Ultimately about 200 miles of Texas coastline was significantly affected. Skidaway Institute is part of a consortium of research institutions called SECOORA (Southeast Costal Ocean Observation Regional Association). Our fellow SECOORA partners are also monitoring the progress of any oil in the Loop Current and Gulf Stream. One of our SECOORA partners, the University of South Florida, has an excellent video of the projections based on several models. You can see it here. Notice that the models don’t all predict the same paths. Modeling is difficult in areas of the ocean where there are few real world observations to improve the model’s performance with. Forecasters look at several models, and use their experience and good sense to predict which is most correct under different circumstances. Watch out for the polar bears! Skidaway Institute research tech Victoria Baylor and grad student Zac Tait just returned to warm, sunny Skidaway Island from their first sample trip to Barrow, Alaska. Here is their account of their interesting trip. 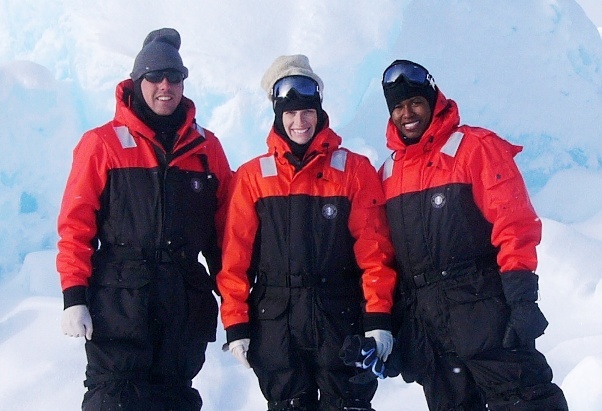 Our trip was part of our Professor, Dr. Marc Frischer’s, three-year project to study the effects of climate change (ie: global warming) on microscopic organisms in the Arctic Ocean. You can read more about this project HERE. 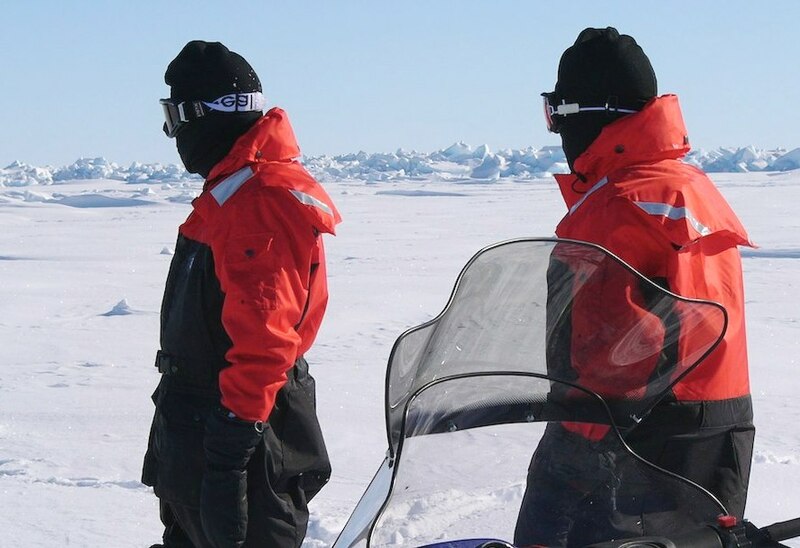 We left Savannah on April 20th to join collaborators from the Virginia Institute for Marine Science and the University of Georgia at the Barrow Arctic Science Consortium campus where we did our lab and field work out on the sea ice of the Arctic Ocean. We made it out on the ice three separate times to conduct our research. The temperature ranged between zero and 25 degrees Fahrenheit, just a little cooler than what we are used to in Coastal Georgia. During this time of spring in Barrow Alaska, there were 18 hours of sunlight each day. Luckily, we had so much to do each day none of us had trouble falling asleep with the sun still up. In order to travel out onto the ice, we needed a field guide to provide us direction and protect us from polar bears. Yes, polar bears! That’s sort of ironic when you see all those pictures floating around on the internet of polar bears on melting ice floes. To get to our sample site, we drove snow machines across the frozen Arctic Sea on ice trails cut through ice pressure ridges that in some spots were over 30 feet tall. When we found a site to drill a hole through the ice to collect sea water, the ice was 22 inches thick. We ran a hose underneath the ice to a depth of eight meters and then pumped the water through a series of filters to collect bacteria and other microorganisms. 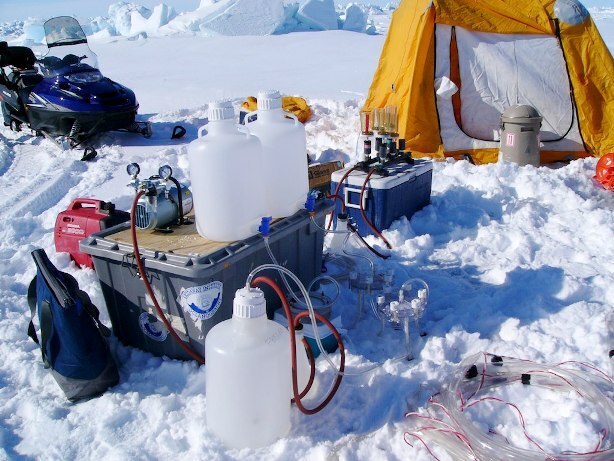 A lab set up on the Arctic ice pack. The samples went into liquid nitrogen and then were shipped back to Skidaway for processing. Barrow isn’t that small of a town considering it’s geography. There are around 4,000 to 5,000 residents that live there year round. At the end of the day, we typically went out to eat. There are many restaurants to choose from including a Chinese restaurant and a Mexican Restaurant. The array of food to eat was surprising but not as surprising as the prices. One Chinese restaurant had a 12 piece bucket of fried chicken for $46! We also visited the local grocery a few times where a gallon of milk costs $11 dollars. We were told the prices were so expensive because all of the food had to be flown up there. On April 28th, we boarded a plane and flew back to Georgia with only 1 to 2 hour layovers at each stop. It was a long trip and roughly 17 hours of flying! Barrow Alaska is unlike anything either of us had ever experienced before. After arriving in Georgia, and being hit by the sweltering humidity, we all missed the cold weather of Barrow a little bit. We have several more trips planned for the future. The next will probably be near the end of August or the beginning of September when the sea ice has melted in Barrow.